This is an easy Waltz sequence composed by Charles W. Gardner in 1909. It won first prize at the Annual Conference of the National Association of Teachers of Dancing that year. Part I - Extended Rollaway with Back to Back Chassé (4 bars): Waltz halfway outward along LOD to end up back to back (1, 2, 3), chassé twice along LOD (with no weight on the second close), still back to back (4, 6, 7, 9), then take other hands and waltz halfway inward against LOD to face partner (10, 11, 12). Part II - Face to Face Chassé, Quick Rollaway (4 bars): Taking two hands, chassé twice against LOD (with no weight on the second close) (1, 3, 4, 6), then rollaway with a full outward waltz along LOD (7, 8, 9, 10, 11, 12). Part III - Promenade and Sway (4 bars): Side by side, holding inside hands, promenade six steps along LOD (1, 2, 3, 4, 5, 6). * Then sway along LOD (7), closing second foot without weight (9), and sway against LOD (10), closing first foot without weight (12) and closing up to waltz position. * Though not explicitly specified, this works nicely as a slight vis à vis: facing slightly away from partner on the first three steps, and slightly facing partner on the second three. Part IV - Waltz (4 bars): As a couple, waltz two full turns. 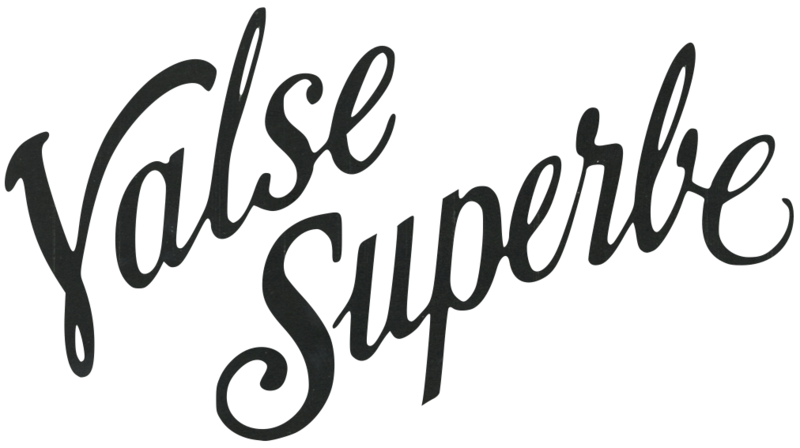 "Valse Superbe" by Clement Harris is the original tune, but it can also be danced to any rotary waltz with continual eight-bar phrases. 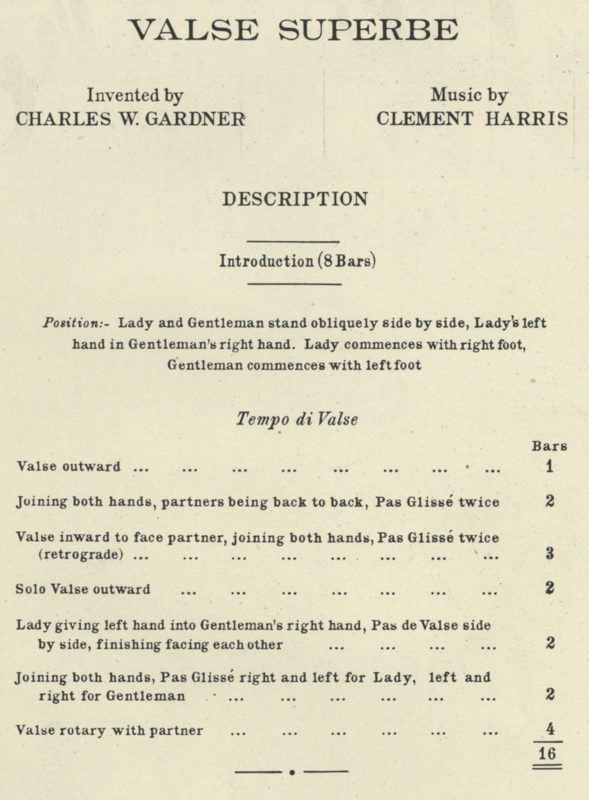 Charles W. Gardner (dance), Clement Harris (music). (©1909). Valse Superbe. London. Official Board of Ballroom Dancing. (1950). Old Time and Sequence Dances (Completely Revised Edition). London. Sydney Thompson. (1950). The Theory & Practice of Old Time Dancing. London. Michael Gwynne. (1953). Old Time And Sequence Dancing (Revised Edition). London. Charles Crathorn. (1963). Old Time Dancing. London.